The so-called Last Supper was not the last we know that nourished Yeshua of Nazareth and his motley crew of ne’er-do-well friends from Galilee. The other ones had fish swimming into them. For two millennia, Christians all around the planet have faithfully practiced the Ritual of the Open Table—one where everyone has a place at that table to have their hunger curbed, their thirst slaked, and their dignity respected. Other faiths have similar rites of sharing food among both friends and strangers as well. Whether we immediately recognize it or not, each time we share a communal meal such as what Christians call the Eucharist, we are engaged with friends, family, and neighbors in a rite that is at the same time revolutionary and re-conciliatory. It is not about exclusivity. This is not a supper club for the elite or the saved. It is not just about humankind, either. It is about bonding with the land, sea, and atmosphere that remain necessary for our health and our nourishment, just as much as it is about the farmworker, food service worker, fisher, vintner, and farmer who bring us our daily sustenance. Whenever I partake of this sacrament, I try to imagine myself in solidarity with hundreds of millions of others who dared to break bread together and sup from the same cup in defiance of the forces seeking to divide us. In that sense, the Eucharist was not originally meant as an esoteric, restricted practice performed by Christians to bond only with other Christians, but to join hands with all of humanity and to join paws, wings, and fins with all species, no matter what other expressions of faith (or lack of them) may be among us. Eu-charis. True gratitude. Good grace. Thanksgiving. Today, the practitioners of this rite might be ensconced deep within a basement hideaway in Aleppo, Syria, wondering just whose bombs and missiles are rattling their neighborhood at that particular moment in history, while feeling astonished that they remain alive. They might be undocumented farmworkers who briskly walked in to worship in a rural church, knowing that the law enforcers from the Immigrations and Customs Enforcement (ICE) will be waiting in their trucks just outside the church when they walk out the door of the sanctuary into the harsh light of this day. They might look like a couple of gay sous chefs who can be suddenly dismissed from their jobs at a restaurant when its manager unilaterally decides without consulting anyone that their presence might not be good for business. They might be a father and his estranged son meeting for the first time in years at the church service to celebrate the life and the death in flesh of the boy’s godmother. Nevertheless, we often fail to remember a “later supper” which Yeshua shared with his friends on the shores of the Sea of Galilee. It occurred sometime after his crucifixion. His friends had gone fishing that night, but, like the first time they met Jesus, they hadn’t caught a thing. “No luck, no catch,” the one closest to him replies. “Well then, cast your net off the right side of the boat . . . They feel so much weight in the net that they can hardly haul it up. It’s loaded with a teeming abundance of fish! and jumps into the water, for he had been stripped down. To drag the net into the shallows without ripping it loose. For the reheating of bread and the grilling of fish. And counting some 153 fish as he brings them onto the landing. Even though they were exceedingly heavy, the net did not tear. And yet day by day your Abba feeds them. Are you not as valued as they are, or more? It is through Yeshua’s gracious preparation of bread and fish—not bread and wine—that his disciples realize they are capable of living and participating in the presence of unanticipated miracles, sudden windfalls of abundance, and feasts of sustenance that can nourish not just their own bellies, but thousands of others in this whirling and wounded world groaning with hunger. By spontaneously offering them bread and fish rather than just harking back to the “Last Supper” of bread and wine, Yeshua offered them a dynamic sacrament, one that was not rigid and fixed like a rabbi’s rule in the temple. 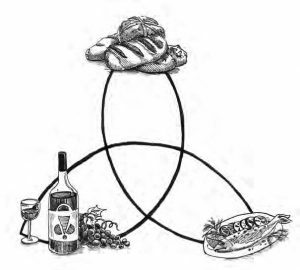 And so, the dynamic triad of bread, wine, and fish can become for us another kind of Sacred Triad, one that brings together gritty earth, heavenly ferment, and salty sea creatures into a sacrament that changes before our eyes. The bread rises with the yeast and grains from the earth, while the grapes ferment into something altogether heady and quenching. The fish wriggles on well after the crucifixion and the death that threatened to stop the world in its tracks. than sustenance was involved. Not less, but more. eating with tax collectors and sinners, peasants, gluttons, and drunkards] drew. Yeshua was disparaged, persecuted, and ultimately killed for breaking the rules of exclusion and purity that separated Pharisee and scribe from peasant farmer, fisher, farmworker, and slave. And that’s why, not long after his reappearance among his fishing and farming friends, he invited all of them to share in the wild abundance of constant Creation and re-creation once more. More bread, wine, and fish just kept appearing on the table. May the diversity of people (and species?) sharing them at the table continue to grow with the astonishing fecundity of little mustard seeds. Organic Approaches to Modern Apiculture (2013, with Ross Conrad). During the summer he works his orchard near the Arizona-Mexico border, and throughout each year he collaborates with local organizations to help create a local foodshed in that area. 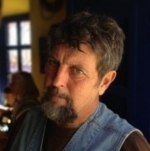 His interests include permaculture, the use of native foods to prevent diseases such as diabetes (see Native Seeds/SEARCH), seed preservation, and habitat restoration in the American Southwest. He serves as an Ecumenical Franciscan Brother, and is actively involved with the Franciscan Action Network, helping shape an ethical response to environmental concerns.